Abstract. In this paper we present a GPU implementation to accurately select 3D objects based on their silhouettes by a pointing device with six degrees of freedom (6DOF) in a virtual environment (VE). 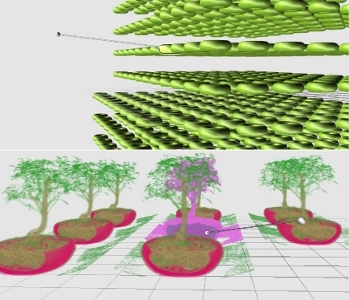 We adapt a 2D picking metaphor to 3D selection in VE’s by changing the projection and view matrices according to the position and orientation of a 6DOF pointing device and rendering a conic selection volume to an off-screen pixel buffer. This method works for triangulated as well as volume rendered objects, no explicit geometric representation is required. 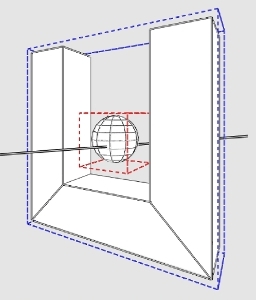 Left: Coarse bounding volumes introduce selection ambiguity as the bounding box of the sphere is contained within the bounding box of the non-convex U-shaped geomtry. Right: A silhouette based approach is required for objects with holes in them (e.g. a torus) or for volumetric object with no explicit geometric representation (e.g. the volumetric bonsai).